The AV node can be blocked, in which case there is a slow heart rate and the affected patient becomes dizzy or might faint. With this heart problem not enough blood gets pumped to the brain. The obvious thing to do is to place the person on the floor (horizontal position) and call 911 immediately to get an ambulance, which will bring the patient to the nearest hospital. At the hospital the physician will order an ECG, which confirms the diagnosis of a “complete heart block“ (thanks to www.ecglibrary.com for this image). What has happened in such a case? Was this preventable? What has happened is that the two parts of the heart, the atrium (where the blood enters the heart) and the ventricle (which serves as the main pump), are beating at their own rates. The ventricle (main heart chamber) is beating at a much slower rate due to a blockage of the transmission of electrical impulses in a relay station. The atrioventricular node (or “AV node” for short), how this relay station is medically termed, gets sluggish with age and with heart disease, particularly when the small heart vessels including the nutritional vessels of the nervous system of the heart are affected. There are different stages of heart block, such as 1st, 2nd and 3rd degree heart block. The electrical system of the heart has a different configuration for each of these subtypes. The ECG can be used to diagnose these different types. Treatment for this condition is first a temporary pacemaker, later a permanent pacemaker (thanks to www.nlm.nih.gov for this image). This is a device, which comes with a long-lasting battery and has an electrode, which is inserted in close contact with the heart muscle. 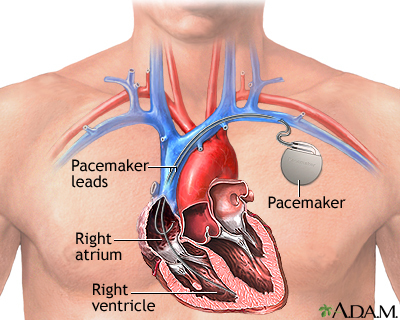 The pacemaker takes the place of the sinus node and the electrode prevents any blockage, so that the electrical impulse is directly delivered to the heart muscle. Every 10 to 12 years such a pacemaker has to be replaced with a new one which is done under a local anesthetic on an outpatient basis (Ref.2, p. 871). Prevention in general terms consists of anything that will prevent hardening of the arteries. This involves not to smoke any tobacco, doing regular exercise, healthful food intake and weight loss down to an ideal body mass index. 1. The Merck Manual, 7th edition, by M. H. Beers et al., Whitehouse Station, N.J., 1999. Chapters 197, 202, 205 and 207. 2. Braunwald: Heart Disease: A Textbook of Cardiovascular Medicine, 6th ed., 2001, W. B. Saunders Co.
3. D C Bauer: Audio-Digest Family Practice Vol. 49, Iss. 09, March 2, 2001. 4. Ferri: Ferri’s Clinical Advisor: Instant Diagnosis and Treatment, 2004 ed., Copyright © 2004 Mosby, Inc.